One nostril or two? Hard blow or gentle? Some ways are more effective and less risky than others. If you have a blocked or runny nose, chances are you’ll reach for a tissue or hanky to clear the mucus by having a good blow. But is there a right way to blow your nose? Could some ways make your cold worse? And could you actually do some damage? The three most common reasons for extra mucus or snot are the common cold, sinusitis (infection or inflammation of the sinuses, the air-filled spaces inside the face bones) and hay fever. Each of these conditions cause the lining in the nose to swell up, and to produce extra mucus to flush away infection, irritants or allergens. Both the swelling and extra mucus lead to nasal congestion. This is when the narrowed passages increase the effort of breathing through the nose. Clearing the mucus by blowing the nose should reduce this congestion somewhat. At the beginning of colds and for most of the time with hay fever, there’s lots of runny mucus. Blowing the nose regularly prevents mucus building up and running down from the nostrils towards the upper lip, the all-too-familiar runny nose. Later in colds and with sinusitis, nasal mucus can become thick, sticky and harder to clear. Think of “snotty nosed kids”, in particular infants or toddlers who haven’t yet learnt to coordinate the mechanics of blowing their noses. They tend to repeatedly sniff thick mucus back into their nose or allow it to dribble down their upper lip. Keeping this mucus (rather than blowing it out) is thought to contribute to a cycle of irritation that causes the snotty nose to persist for weeks or longer. This may be due to the retained mucus acting as a good “home” for bacteria to grow in, as well as fatigue of the “hairs” (cilia) that cleanse the nose by moving along mucus and carrying with it irritants, inhaled debris and bacteria. Thick retained mucus is also more likely to be transported to the throat rather than gravity working it from the nostrils, leading to throat irritation and possibly a cough. This is the mechanism behind the most common cause of prolonged cough after a viral infection or hay fever, known as the post-nasal drip cough. So it makes sense to encourage people to blow their nose to remove unwanted mucus. Although extremely rare, there are a few examples in the medical literature of people blowing so hard they generated pressures high enough to cause serious damage. In most of these cases people had underlying chronic sinusitis or an existing weakness in the structure they damaged after blowing too hard. These injuries included fractures of the base of the eye socket; air forced into the tissue between the two lobes of the lung; severe headache from air forced inside the skull; and rupture of the oesophagus, the tube that sends food to the stomach. One study looked at the pressures generated when people with and without a range of nasal complaints blew their noses. People with chronic sinusitis generated pressures significantly higher than people without a nasal complaint, up to 9,130 Pascals of pressure. They also found blowing by blocking both nostrils generated much higher pressures than blowing with one nostril open. One study showed how blowing your nose hard could send mucus from the nose into the sinuses, potentially infecting them too. Another study comparing pressures from nose blowing, sneezing and coughing found pressures generated during blowing were about ten times higher than during the other two activities. More worrying was their second finding – viscous fluid from the nose had found its way into the sinus cavities after vigorous nose blowing. The researchers said this could be a mechanism for sinus infection complicating some colds, with the introduction of nasal bacteria to the sinuses. But they did not produce evidence for this. On balance it seems repeated and vigorous blowing of the nose may carry more risk than benefit, even though it seems to be a natural response to nasal congestion. Can I take anything to stop the snot? So looking to remove the need to blow so forcefully is probably a better option. Decongestants and antihistamines, which you can buy without prescription from pharmacies, reduce both nasal congestion and the volume of mucus. Decongestants contain ingredients like oxymetazoline and phenylephrine and come in tablets or sprays, and are often included in cold and flu tablets. They work by constricting (narrowing) dilated blood vessels in the inflamed lining of the nose, and decreasing the volume of mucus produced. 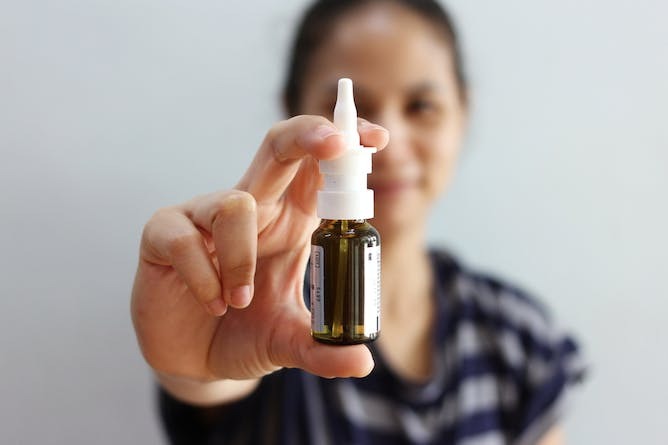 While decongestant sprays are effective, they are probably underused due to concerns about nasal congestion when you stop taking them after long-term use (rhinitis medicamentosa). But further studies have questioned this increased risk. Antihistamines treat nasal congestion associated with hay fever, but may be less effective for treating cold symptoms. Saline nasal sprays and washes can help. 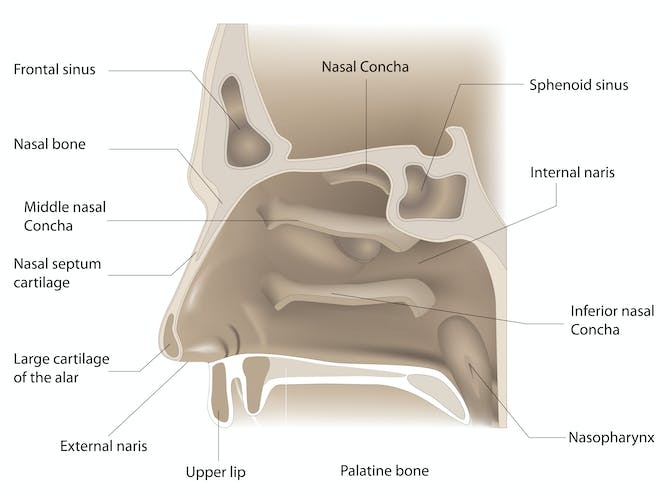 Saline nose sprays have some evidence they work for acute and chronic rhinosinusitis (inflammation of the nasal lining and sinuses), and can reduce the need for medications. They are believed to clear mucus through increasing the effectiveness of the cilia as well as diluting thick and sticky mucus. A related technique, known as nasal aspiration, is when you squirt liquid saline up the nose with a special medical device to flush out mucus and debris from the nose and sinuses. One study found it lowered the risk of developing acute otitis media (inflammation of the middle ear) and rhinosinusitis. If you have mucus in the nose, it is probably best to get it out, so blow gently or by clearing one nostril at a time. Use of appropriate treatments can lessen the need to blow, and the force required to clear your nose. 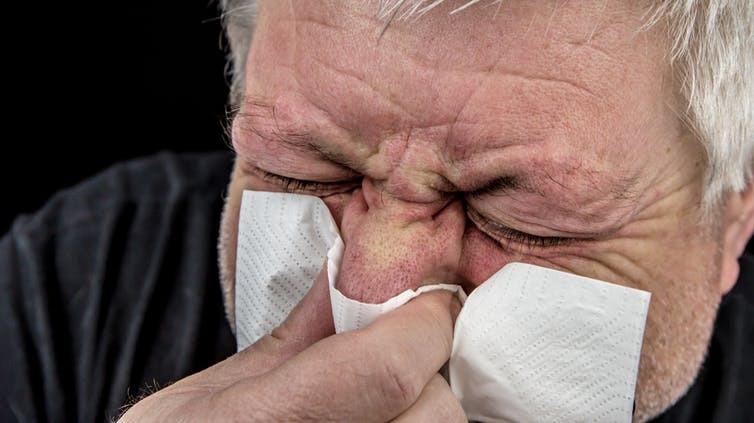 If you are repeatedly blowing your nose you probably have a nasal condition, like hay fever or sinusitis, which should be treated more comprehensively. And if you see a snotty-nosed kid, please wipe away the mucus discharge for the benefit of all.